When there's no time to craft | Cobberson + Co.
Back in August, I told you about my boys asking me to knit them up some Harry Potter robes. Shortly after starting, my first grader decided he wanted to wear his robe as his Halloween costume, which seemed pretty awesome and a way to get a huge head start. So I took my sweet time the first month, knitting a few rows here and there, thinking I’ve got this, no big deal, there’s still like two months to go before Halloween. Then work suddenly became insanely busy and for a few weeks, all I did was wake up, go to work, come home and make dinner, work, go to sleep, repeat. During those weeks, two things happened. 1. 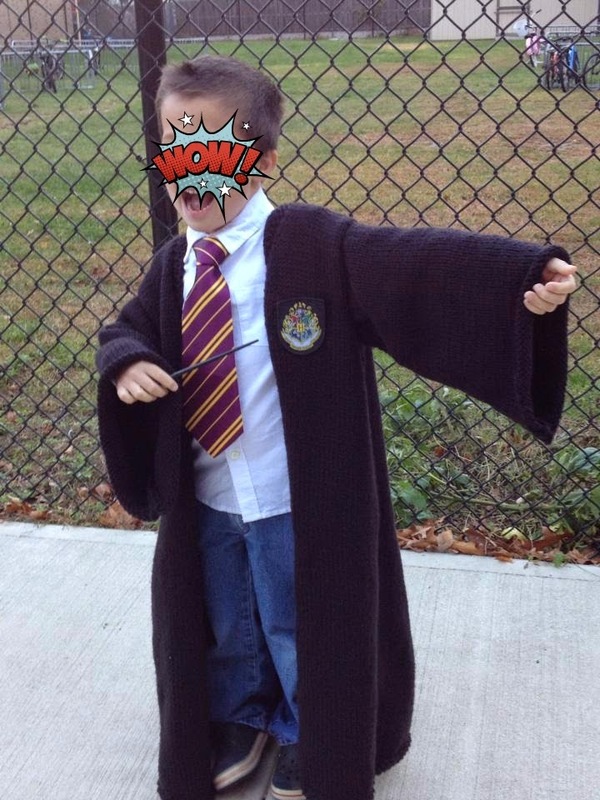 My first grader asked me every day if I had finished his HP robe yet. Every day I said no, but I promised him that it would be finished in time for Halloween. I rarely promise anything to the kids, because I never want to break my promise to them. But I was pretty confident in my ability to finish this robe, and he REALLY loved that scarf that I made him last year, so I knew he’d be so happy with his mom-made costume. And 2. Those few weeks of zero creativity were excruciatingly long and depressing. I don’t know about you, but if I don’t have a chance to make something, anything, on a given day, I get ridiculously antsy. That’s probably why I love knitting the most- you can turn mindless relaxation time (which we all need, right?) into productive time. Watch some tv, end up with a sweater. Once those few crazy weeks ended, I kicked my knitting into overdrive, because omg, that was a LOT of stockinette to tackle with only a few more weeks until Halloween. Every spare minute after the guys went to sleep was spent working on the robe. I started taking my knitting bag with me everywhere, getting a few rows in during lunch, or on the ferry. One week out from Halloween, and I was in a panic. I had the entire back finished and half of the front right section, which meant I was still missing both sleeves,one and a half front pieces the hood, plus everything had to be sewn together. But I couldn’t break my promise- I was finishing this robe on time if it killed me. For the rest of the week, after we came home and ate dinner, I worked on the costume until I fell asleep. Then suddenly Halloween was the next day and I was still missing a whole sleeve and hood (which I made the last minute decision to forgo, since it wasn’t a critical piece). I stayed up all night making the sleeve and finally sewing everything together around 3:30 am. The costume was finished at 6:15 am, and have never felt so proud of any project I have ever made. It may not have been the most complicated project, or had the most intricate patterning, but I was able to keep my promise to my little guy 🙂 He was so happy and proud to wear his robe to school for their Halloween parade.